Is there anything better than two companies combining their amazing products? Today I have a joint venture by Prima Marketing and Faber-Castell! Not only do their products work perfectly together, but they provide wonderful platforms for inspiration and creativity!! They've also included a chance to win some of their products. 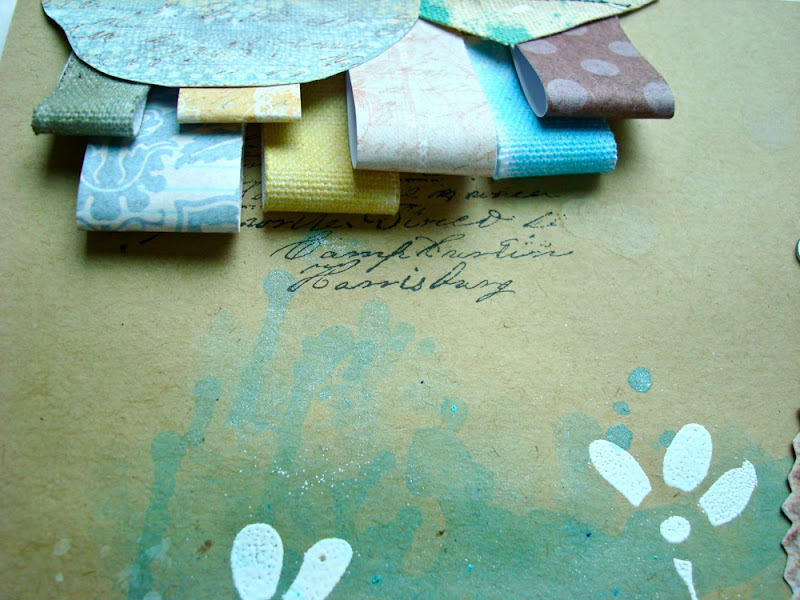 Hop around to our talented design team blogs and leave a comment on each of the blogs. Once you are done, come back to the Prima and Faber-Castell blogs and let them know your favorite technique. They will pick a random winner on the Prima blog May 30th! Faber Castell will also have a prize so make sure you go to their blog for details on how to win! If you came here via Jill's link, make sure you follow all the blog links below and return to the Prima and Faber-Castell blogs. 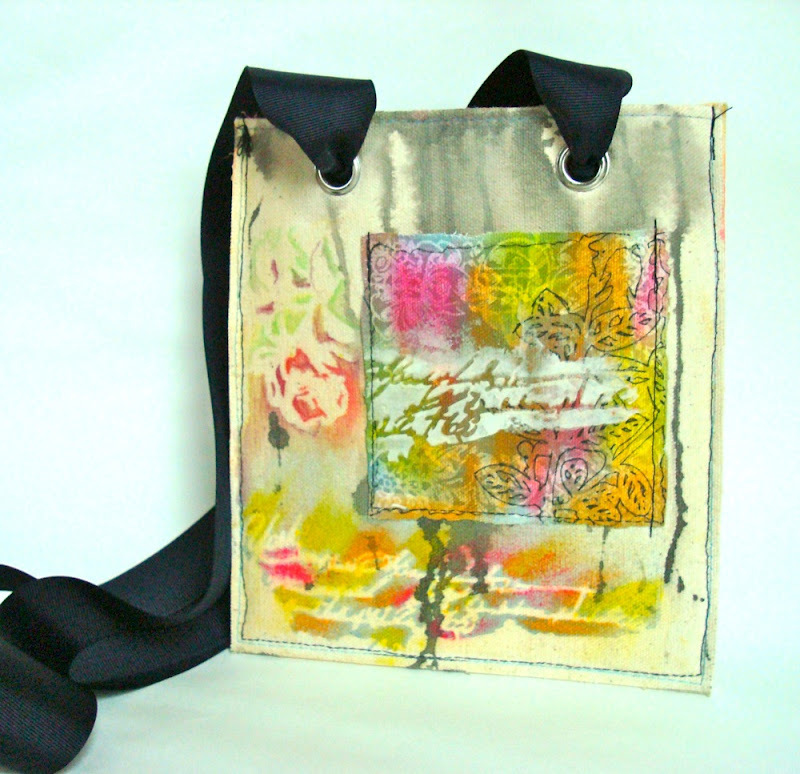 First up is a purse I made with Donna Downey's refill canvas pages, some canvas resist pieces and of course Faber-Castell DMC Gelatos, Aquarelles, and Pitt Artist pens. A pocket made from one of the resist canvas pieces with Gelatos over a Prima mask, pens, modeling paste and Aquarelles. The back of the purse! Some more modeling paste, Gelatos, resist canvas pieces. Inside of the purse with some more Gelatos! I used ribbon for the handles. Faber-Castell Gelatos: Bubble Gum, Lemon, Tangerine, Pistachio, Lime, Green Tea, Blueberry, Bosenberry, Metallic Blue, Metallic Green, and Black. My second project is a layout that I created using some of the Fairy Belle papers, cotton writer's tape, foam stamp, ATC canvas, leaves, letters, resist canvas pieces, and some packaging! My son watching TV surrounded by his car and truck toys makes me so happy! I love the colors in the Fairy Belle and Sun Kiss! 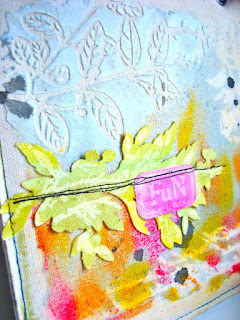 Stamps with PITT Big Brush Artist pen and embossing powder from WOW! Oh and how could I forget... Gelato drippage!! 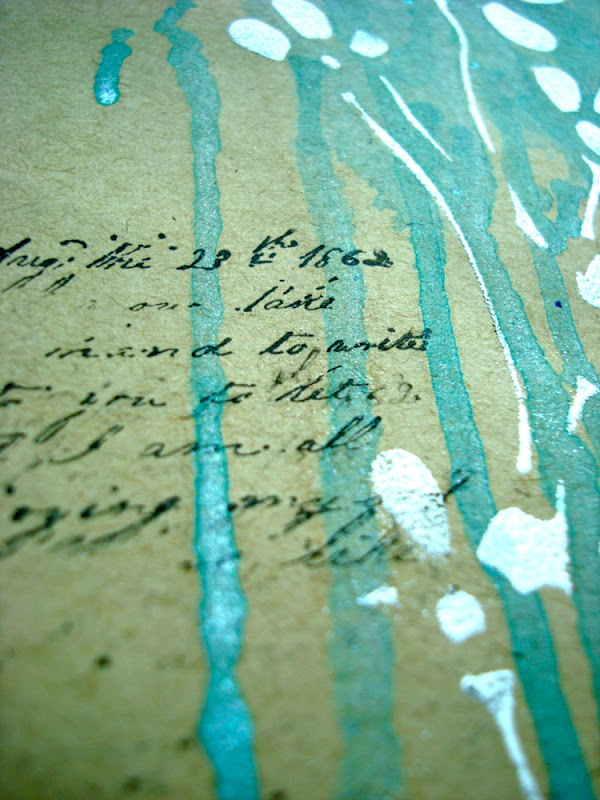 I added color using Gelatos on a mat and added water, then dripped them onto the page. 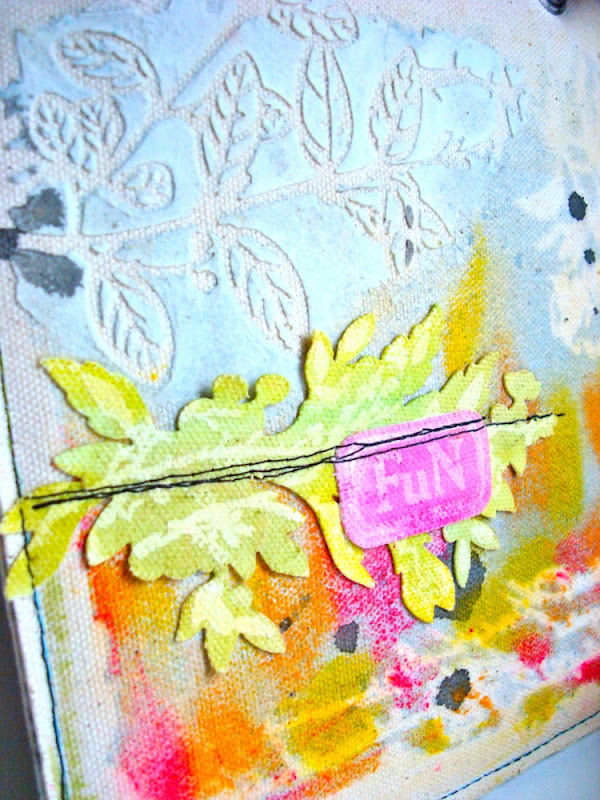 I also colored the cotton tape with various colors and used them to add some texture and color to the page. I absolutely LOVE working with Prima products along side Faber-Castell DMC media!! It's a match made in heaven! I hope you liked my projects... leave a comment below about what techniques you like best from my projects and I'll pick a winner of a set of Aquarelles in one of our color combos of your choice! Leave a comment by midnight on May 30th here and don't forget to continue on and leave comments on all the links below! Jennifer Matott: YOU ARE HERE!! GREAT projects! 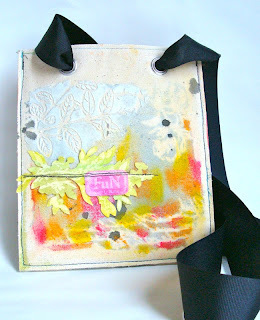 Such a pretty bag and I love that you decorated the inside too, and the layout is wonderful. Love all those loops of canvas/ribbon. My favorite technique you use was the drippy gelato technique. Such a cool look. that was seriosly cute projects! Such fun projects and great colors! TFS!! Love the purse...you left no detail out! And the layout is amazing! The purse is sooo cool and your layout is great! Love the purse and all it's colours. And also loving how you used the colours on the layout. Love the tags as well. The gelatos on fabric gives a stunning effect. Nice work on both projects. The Pitt Pen and embossing powder might just have been my favorite. I have never used the Pitt pen--I guess I need to get one. I also like the watercolor pencil idea. Fabulous projects - thank you so much for sharing your techniques for both of them. That purse is fantastic. Beautiful projects. I love the Gelato dripping. The dripping Gelatos look COOL. I'd like to do different things like that. Beautiful bag and layout! Mixed media goodness! I love the "gelato drippage" and the resist canvas. I love both the projects and the colors. WOW, who would have thought to create a purse using all these products? YOU , that's who!! Really beautiful and I want to own it! I love the gelato dripping technique you used in your second layout with your son watching tv. So simple, and yet I never would have thought of it on my own! Thanks for not only hosting but offering us a chance to win on your site as well. Love your projects - the bag is unusual - and beautiful and I love the layout with all the ribbon strips around the photo - so beautiful!!! J'aime beaucoup le sac, les couleurs sont extra! wow!!!! !Gelatos aer on my want list!! These are amazing....seriously! And i am drooling over the layout with the drippage!! Your purse is incredible!! love how the gelatos work so well! Wow! You did Donna / Prima proud. Great purse. Your layout is outstanding as well. 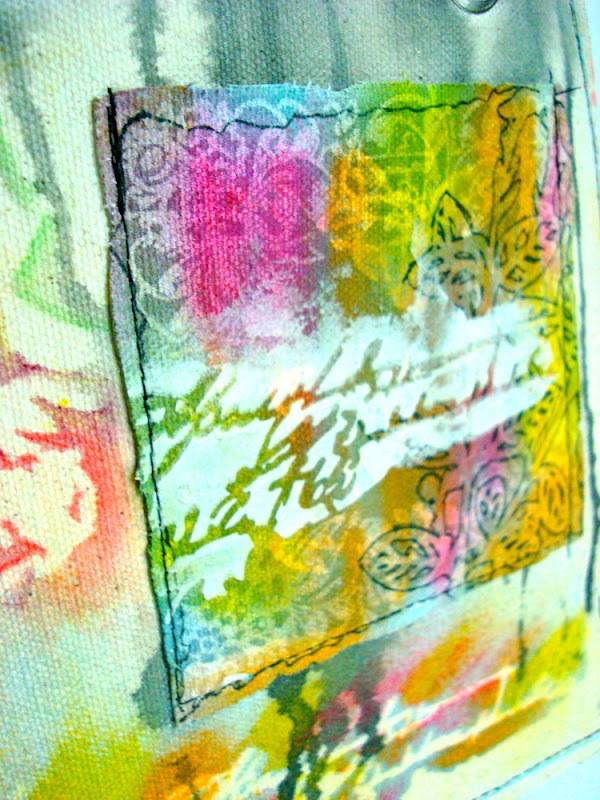 I like "A pocket made from one of the resist canvas pieces with Gelatos over a Prima mask, pens, modeling paste and Aquarelles." That is very cool. Amazing projects! That purse is so beautiful, I don't think I'd ever want to actually use it! Gorgeous!! WOW! are those gelatos run proof once they're dry?? 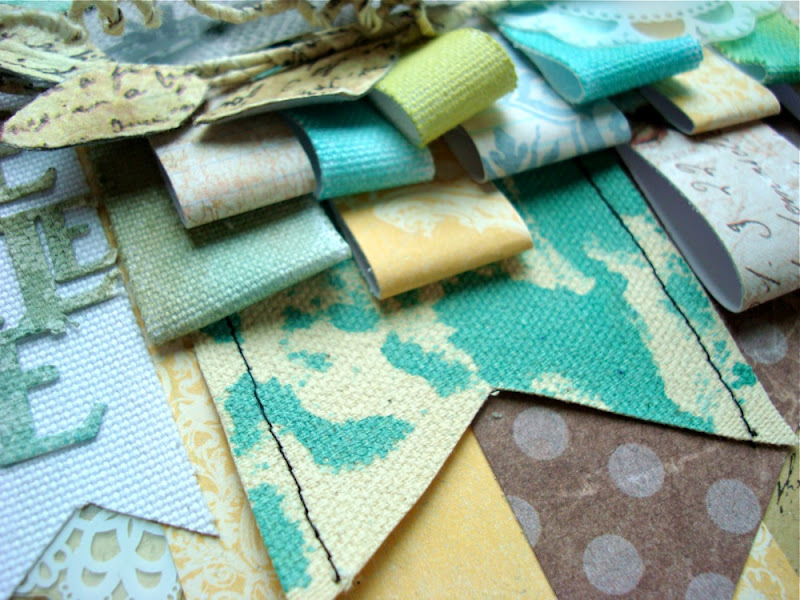 i really love the artful look of your projects! What a beautiful purse! Neat idea!! Fantastic projects! The FC products look great. Yup - I think I want to try my hand at some of the Gelato too now - thanks for the inspiration! Love your LO - and what a great picture of your son! I must try your technique of mixing the gellatos with water and dripping them on - why didn't I think of that?? Fantastic projects!! Your work is beautiful art! You always do such a amazing work!!! I love the purse, it's so pretty! this looked like you had fun with soo many techneques and I love the "drips" they make it stand out. Thank you for sharing. great job. The gelatos seem to be a must have product. So in love what you are doing with the Pens and Gelato! Wow! 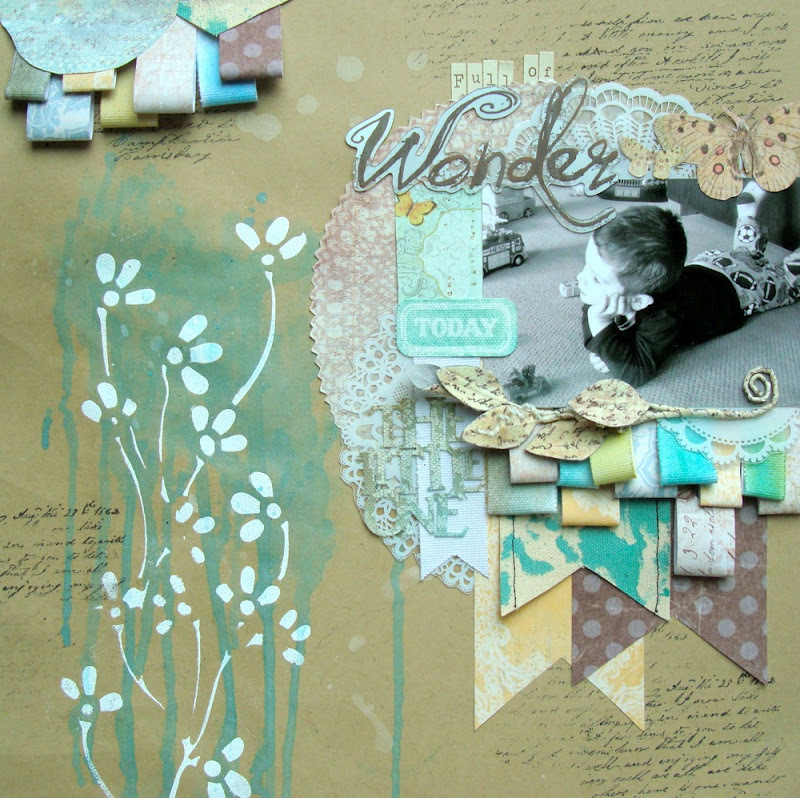 I love all the layering on your gorgeous layout and the colours are so beautiful! your bag is amazing! I love all the masking! I LOVE PRIMA'S FLOWERS & ALL THE wonderful Faber-Castell COLORS. I can't take your creativity--it blows me away!!! The resist is just stunning. the bag is incredible:so beautiful!!!! The gelato drippings - hehe - were my favorite - never seen the gelatos before this blog hop and am intrigued and must find some - Also never heard of the Pitt Pen - I must get out more! Love the layout with your son - Thanks for offering the prize! Great canvas bag and AMAZING layout! WOW!!!! Oh it certainly appears to be a match made in heaven! And your projects are so dreamy, so heavenly!!! I seriously had to go back and forth before finally giving up and choosing ... so I guess I'll say the purse is my fave, the watercolored look on the resist canvas is so amazing!!!!! Great layout and canvas! Thanks for sharing! i love the bag!! those inks on canvas look fabulous. The loops of canvas ribbons on your layout added such a great dimension totally caught my attention. Your bag is gorgeous inside and out, wow. This bag is awesome - and unique. I really love the way these pens behave on canvas. I would love to try this technique myself. Thanks for the inspiration. I have to say the gelatos have gotten my attention. They look like they are so much fun to use. 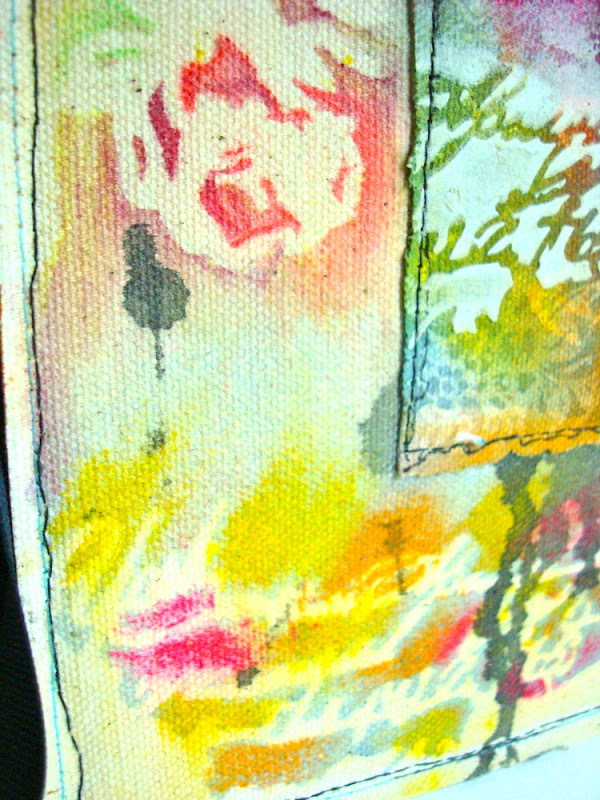 They look like watercolor on the canvas bag. So colorful. Thumbs up! So beautiful! I can't get over that beautiful purse! Excellent use of the modelling paste!!! I love all the texture and designs - it's fabulous! Thanks so much for sharing and for the chance to win some goodies! 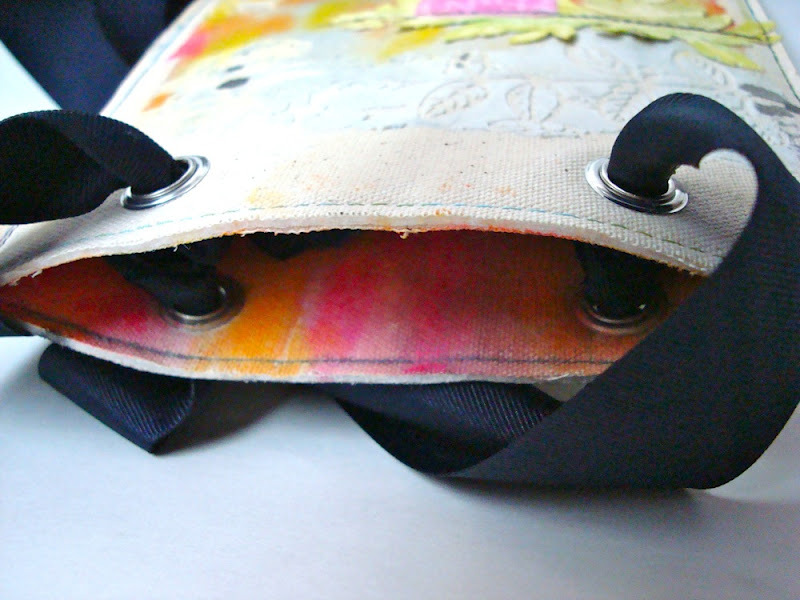 Awesome handbag - such a cool idea, and a beautiful layout! 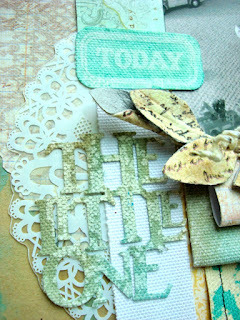 Love the big Donna stamp and the colored tape! Sus trabajos son una maravilla!! wow, your bag is amazing! so colorful and such a good idea! and I love your layout and it's colors. That purse is awesome and so unique, I think it looks easy enough for even me to try!!! and I love how you dripped the gelatos and your canvas strips folding them over like that really gives alot of texture ad dimension to the page. Really wonderfull and I love your projects! 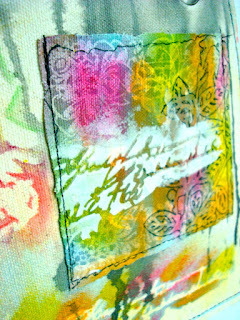 !and the gelatoes on fabric!! I love how you coloured the cotton tape and ribbons to match your layout colours. That's a technique I would love to try myself _ I just have to get my hands on some Faber Castel first! Thanks for sharing and the chance to win. Thanks too for providing a bonus prize. I'm a newbie to card making!Thanks would love to get a chance to win! Love your use of colour! Love Aquarelles! Love the resist effect on the bag. That bag is beautiful! Awesome projects! i love the ribbons on the lo, great idea!